Starting out, Winn had convinced Siobhan to go to the DEO for help, but they clearly have no idea what’s going on with her. All they can really do is confirm that she is in fact human. While there Siobhan stumbles across Livewire, and overhears her talking about wanting to hunt down Cat Grant and Supergirl. They formally introduce themselves and I loved that their first instincts were to simply talk to each other. That said, I have always thought Barry was too trusting with his secret identity, and he quickly takes his mask off and tells Supergirl his real name. I guess it could be because he figures he might not ever be on this Earth again. But throughout the episode he does seem pretty loose with it, even for him. Of course he has a history of that so I can’t say I’m too surprised. Flash realizes he is on the wrong Earth when it’s clear Supergirl has never heard of him, or any of his other allies (Green Arrow, Firestorm, etc). Kara takes Barry back to Catco where he meets James and Winn. All four characters had great reactions during this scene. Winn immediately took to Barry, delighting at learning the multi-verse existed. James, for the first time, showed real signs of jealousy when it came to Kara. Clearly he felt threatened by another super-hero being in town. Barry was shocked at first to learn that Kara was an alien, but quickly got over it. I was surprised that they didn’t point out he was basically an alien to their world. And lastly, even Kara was impressed with how Barry demonstrated his power. It was clear that the actors were all having a ton of fun, and that showed in their performances. Siobhan goes to her Aunt, who owns a magic store, and tells her she is seeing images of a Banshee in her head and she can’t figure out why. Her Aunt explains that their family was cursed generations ago, and that the visions won’t stop until Siobhan kills the person who wronged her. This leads Siobhan to realize that to get to Kara, she might need help to get past Supergirl, so she goes back to the DEO (apparently just able to waltz right in) and breaks Livewire out. When news of the breakout gets back to Kara she tries to get Cat to leave the city. Cat refused though, stating that she had help from Supergirl last time and trusts that she will have help again. At this point, Cat has completely moved bast the events of the Red Kryptonite episode. Kara goes to Barry for help, but at first he was reluctant , wanting to work on how to get back to his Earth, but she convinces him to aid her. I couldn’t help but remember the first time he truly teamed up with the Arrow, where he was the more inexperienced hero, but eager for a team-up. Even the way Kara said “Partners?” and went to shake his hand was reminiscent of Flash and Arrow. Kara takes Barry the DEO where they are able to track down Livewire. Barry wanted to come up with a plan, however Kara just wanted to go and wing it. Supergirl got to the warehouse Livewire was in first, and told Flash that she beat him. He claims to have been checking the perimeter so technically he was first. That’s may have been a call-back to that first team-up with Arrow, when he was told he should always check the surrounding areas since he is fast enough to. Their lack of preparation got to them though when they were quickly overwhelmed by Siobhan and Livewire. Siobhan at this point has fully embraced her identity of The Silver Banshee. It’s not clear if she is just wearing make-up or has truly changed forms. In the comics, Banshee truly looks like a demon, but Livewire did mention needing to give Siobhan a make over. I have to say, while fighting Livewire, Flash tried his power where he throws his lightning. I am pretty sure that was just the creators wanting to work that power into the episode. I have a hard time believing someone as intelligent as Barry would try throwing lighting at someone made of electricity. While regrouping, Kara apologizes for rushing into things and explains that she is trying to win back the City’s trust as quickly as she can after the Red K. events. Barry, ironically, tells he she needs to just take it slow, and that when he went through something similar it took time. At this point I was thinking, that even though they just met, I feel that if they were on the same Earth permanently they would become best friends. Interestingly, she seems more ready to take Barry’s heroic advice than Superman’s. Perhaps its an age thing? Back at the DEO Barry mentions that he has had experience with a rogue called the Pied Piper, and has learned how to deal with sound. He creates some earplugs that are strong enough to withstand Banshee’s powers. Good timing too since she, and Livewire, had just kidnapped Cat. When they go after Banshee and Livewire, the ear plugs work effectively rendering Banshee effectively useless. At one point she did punch Supergirl, with what looks like enhanced strength, but it’s clear that really didn’t do anything. Flash chased Livewire around and she seemed to get the upperhand. She then tried to shoot a helicopter but Supergirl got in front, taking the lightning blast. When she falls to the ground weakened, the surrounding bystanders step in between Supergirl and Livewire. Moved by Supergirl’s efforts to save them, they decide to help as much as they can, but it was a couple of firemen who ultimately saved the day by shooting Livewire with water, causing her to lose control (and ultimately zap Banshee in the process.) In an episode featuring both The Flash and Supergirl, I didn’t expect it to be regular people who stopped the villains, but I enjoyed that twist quite a bit. When all is said and done, Barry theorizes that Kara could use her power to give him the speed boost needed to break the dimensional barrier. But before they do he encourages her to tell James how she feels. After a hug, and a brief race, they send Barry home. Kara takes Barry’s advice, and confesses her feelings to James. Afterwards he seems to be ignoring her, but really is in a trance along with the rest of the city, and it cuts to Non, holding the Omegahedron (last scene in the episode with Indigo), who says Myriad has begun. I hope that on The Flash they designate Supergirl’s Earth with a number to keep it separate from the others. The overall tone of the episode was incredibly refreshing. Yes, it was the same tone that viewers are used to on both Supergirl and The Flash, but still it was nice to see, especially since lately fans have been treated to quite a bit of various heroes meeting heroes in dark and gritty stories where they fight each other as much or more than they team-up. I’m curious to know if there is a Barry Allen on Supergirl’s world, and if there are doppelgangers of James, Alex, etc on The Flash’s. Perhaps we will find out someday, since that’s something the producers have indeed talked about. 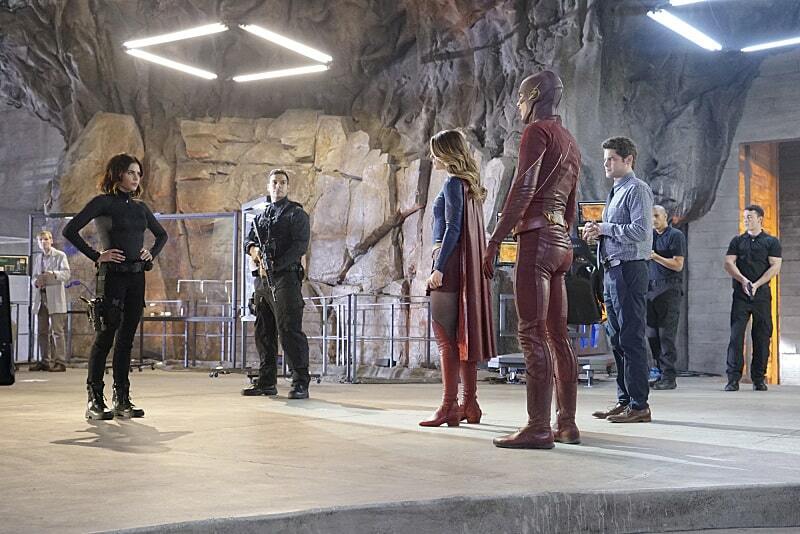 Logistically speaking, I don’t know how feasible it is for this to be an annual thing, the way The Flash and Arrow crossovers are, but I definitely want to see more of Barry and Kara interacting. I can’t help but want to see Green Arrow’s reaction to meeting Supergirl. And if John Diggle still can’t wrap his head around Barry’s speed, imagine what he would think to meeting an alien. Iffy episode personally. Just too many glaring dumb parts. As said throwing lightning at an electricity girl. If they wanted to show off this power, have him throw lightning at Banshee and LiveWire intercept it or something. The helicopter saving part was beyond cring worthy. The crowd all surrounding her and hearing she saves us, she saves us all, ect. It was just too quick and too cheesy. I dont’ know what it is, but Arrow/Flash/Supergirl have all be kind of disappointing the last 2-3 episodes. I thought hey were all so good most the season. Arrow surprising is the most consistent at moment imo. But still its like were in a lul before the seasons endings or something. I did enjoy the Barry teaching moments. It was very reminiscent of as you said Arrow advise to him in their first team up. The whole series is just a string of cringe worthy cheeseball “emotional” moments. It’s targeted at 12 year old girls. Spoiler: Tonight’s episode of the Flash preceeds Supergirl chronologically. They won’t be talking about flying aliens tonight. This was purely due to logistical reasons with the two networks. The episode will end with Barry heading to a new Earth to meet Kara.